Utah has been ranked in every week of the CFP’s Top 25, other than during the 2017 season. 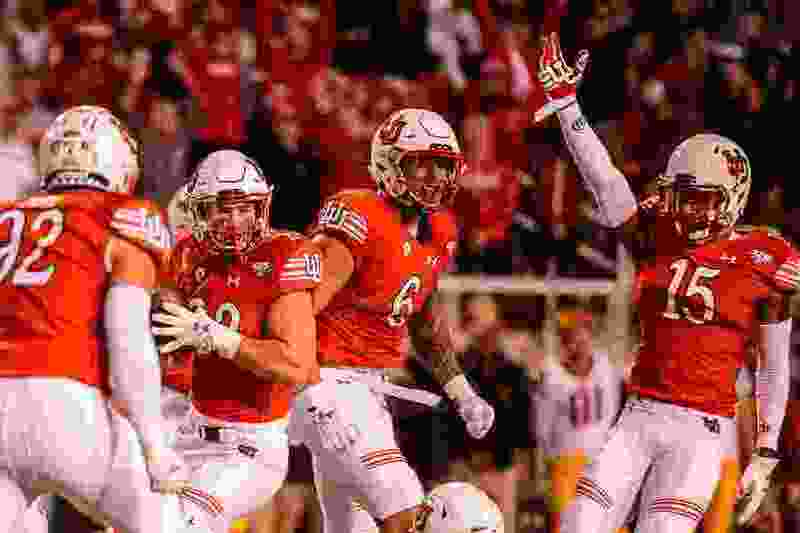 (Trent Nelson | The Salt Lake Tribune) Utah Utes linebacker Chase Hansen (22) and teammates celebrate a first half interception as the Utah Utes host the USC Trojans, NCAA football at Rice-Eccles Stadium in Salt Lake City, Saturday Oct. 20, 2018. After a one-year absence, Utah made the first College Football Playoff rankings of 2018. The CFP committee listed the Utes at No. 15 on Tuesday and left Utah State out of the Top 25. The top four teams are Alabama, Clemson, LSU and Notre Dame. The Cotton and Orange Bowls will host the 2018 CFP semifinals, leaving the Rose Bowl available to a Pac-12 champion that misses the Playoff and giving the Fiesta Bowl a potential opening for another Pac-12 team. Except for the 2017 season, Utah has appeared in the CFP Top 25 every week since the rankings first were released in the middle of the 2014 season. The Utes' CFP highest ranking was No. 10 in November 2015, prior to a double-overtime loss at Arizona. The Utes were No. 12 in November 2016 before losing to Oregon. The significance of this year’s CFP rankings is the Utes' potential landing spot in a New Year’s Six game — likely the Fiesta Bowl — if they fail to win the Pac-12 championship game and qualify for the Rose Bowl. New Year Six’s berths usually are awarded to teams in the top 12. Utah would have a good chance of being ranked in the range with a 10-3 record that includes a competitive loss in the Pac-12 title game. No. 8 Washington State’s weak nonconference schedule may keep the Cougars (7-1) from getting into the top four, even if they finish with only one loss. The CFP rankings don’t include a list of other teams in consideration, such as Utah State, ranked No. 18 in this week’s AP Top 25 as the top MountainWest team in that poll. Regardless of how close they were in the CFP voting Tuesday, the Aggies have a long way to go to overtake No. 12 Central Florida and earn the New Year’s Six bowl bid awarded to the highest-ranked Group of Five team. UCF, coached by former USU offensive coordinator Josh Heupel, is heavily favored in each of its remaining four regular-season games, followed by the American Athletic Conference's championship game. ESPN's Football Power Index gives the Knights at least a 75-percent chance of beating Temple, Navy and Cincinnati at home and South Florida on the road. USU visits Hawaii and Boise State in November, with San Jose State coming to Logan in between. West division leader Fresno State is No. 23 in the CFP and also plays at Boise State this month. If the division champions have the same conference record, the host team in the Mountain West title game will be determined by CFP ranking. Former BYU coach Bronco Mendenhall’s Virginia team is No. 25 in the CFP rankings.